We will put up our films of our October event, featuring Susan Bee, Charles Bernstein and Maggie O’Sullivan in due course. In the meantime, you can listen to a sound recording of Maggie, courtesy of Charles, here. 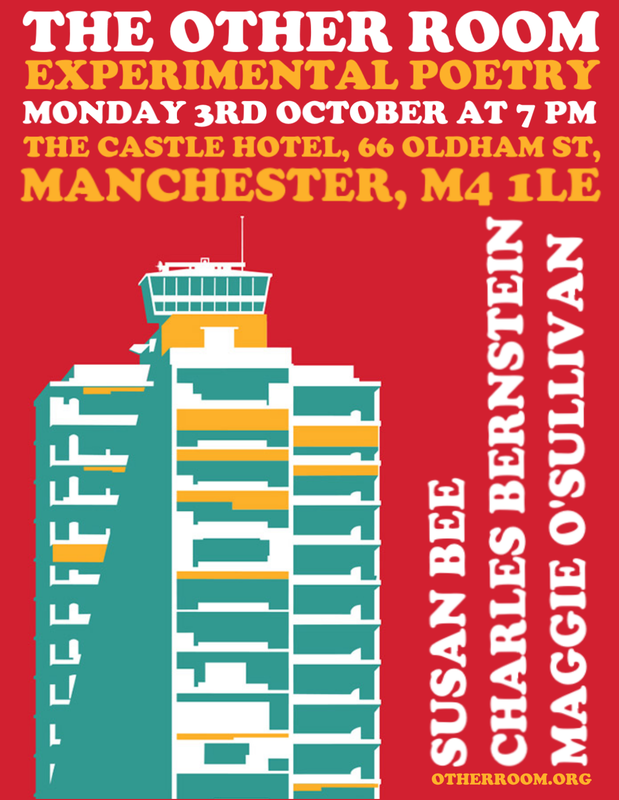 Susan Bee and Charles Bernstein will be reading for us at the Other Room on Monday 3rd October, along with Maggie O’Sullivan. There’s another chance to catch Susan and Charles on their rare visit to the north-west of England on the Friday before, in L:iverpool. Details below. SUSAN BEE is an artist who lives in Brooklyn. She has had seven solo shows at A.I.R. Gallery, NY, and solo shows at Southfirst Gallery, Accola Griefen Gallery, and Lisa Cooley Gallery in NY. She has a BA from Barnard College and a MA in Art from Hunter College. Bee has published sixteen artist’s books. She has collaborated with poets including: Johanna Drucker, Susan Howe, Charles Bernstein, and Jerome Rothenberg. She is the coeditor of M/E/A/N/I/N/G Online. Bee received a Guggenheim Fellowship in Fine Arts in 2014. She teaches at the University of Pennsylvania. CHARLES BERNSTEIN is an American poet, essayist, editor, and literary scholar. He holds the Donald T. Regan Chair in the Department of English at the University of Pennsylvania and is one of the most prominent members of the Language poets, having co-edited (and co-founded) L=A=N=G=U=A=G=E magazine with Bruce Andrews between 1978 and 1981. In 2006 he was elected a Fellow of the American Academy of Arts and Sciences. He has published 17 major books of poetry including Legend, with Bruce Andrews, Steve McCaffery, Ron Silliman and Ray DiPalma (New York: L=A=N=G=U=A=G=E/Segue, 1980), Controlling Interests (Roof Books, 1980), Islets/Irritations (Roof Books, 1992), Rough Trades (Sun & Moon, 1991) The Sophist (Sun & Moon, 1987) and many others, including two selected volumes: Republics of Reality: 1975-1995 (Sun & Moon, 2000) and All the Whiskey in Heaven: Selected Poems (Farrar, Straus and Giroux, 2010). Bernstein is also an important critic and editor of contemporary poetry and this year the University of Chicago press published his Pitch of Poetry. His other remarkable critical writings include:Attack of the Difficult Poems: Essays and Inventions (University of Chicago Press, 2011), My Way: Speeches and Poems (University of Chicago Press, 1999), A Poetics (Harvard University Press, 1992) and Content’s Dream: Essays 1975-1984 (Sun & Moon Press, 1986). Other notable projects include A Conversation with David Antin(Granary Books, 2002) and Shadowtime: a libretto for an opera about Walter Benjamin with music by Brian Ferneyhough (Green Integer, 2005). This is a Liverpool Biennial Fringe Event.